Pull up a chair, folks: we’re going to have a story. It is a cautionary tale of making promises you can’t easily keep, something many newly married couples and the Brexit delivery team have learned the hard way. It will not be easy reading, but there is a point, if you squint hard enough. It starts on a warm Monday afternoon and yours truly is about to do something rash. Phil emails back. “The Lazarus Experiment,” he says. As you might gather, this article contains a soupçon of expletive language. Children, cover your adults’ eyes. I can’t remember the last time I watched The Lazarus Experiment. It’s about as by-the-numbers as it gets. We haven’t spent much time writing about it over at the DWC (which is one reason why Phil suggested it) and I can’t help thinking that there is a reason for that. Still, I’m committed now; many would say it was overdue. And there must be a fresh angle, surely? Something we haven’t considered? Some untapped resource or veiled social commentary? Churches in Doctor Who and how they explode? Poetry that wasn’t written by Steven Moffat? The Coronation Street connection? These are all potentially good ideas and at the risk of territory marking I would like it noted that no one gets to write them except me, but none of them feels right for this. We need something that’s actually about this story, rather than an excuse to go off at a tangent. Joshua’s not the most eloquent when it comes to persuasive speech, but he’s got a fierce imagination and is immensely creative, so I don’t mind. Still, Mark Kermode can sleep easy, at least for now. “I can’t even remember it,” says one of the others. Hang on, that’s a point. What if we did some sort of live commentary? Something I could transcribe? I mean, the Time Team panel in Doctor Who Magazine are so young their combined ages come in at less than three digits. They might have just about overtaken Keith Richards’ physical age, but it’s a close run thing. What if we did it with kids? Sort of Gogglebox with primary school children? Something like The Wife In Space but less obviously staged? Excited by the possibilities, I switch on the TV and set up the sound recorder on my phone. Fifteen minutes later, I switch it off. I’d forgotten that the kids only chatter inanely during things that I want to watch. Otherwise it’s a contemplative silence, the kind shared by comfortable middle-aged couples. None of them has anything to say, interesting or otherwise. It doesn’t help that we’ve been beset by technical issues: my DVD is scratched to buggery and the digital file I encoded isn’t much better; it’s stuttering and occasionally the sound gets out of sync with the visuals, meaning the Doctor speaks with Martha’s voice and vice versa, as the Romans put it. It’s rather like that bit in Singin’ In The Rain. We make it through, but my nerves are shredded: the gods, it seems, are determined that we should not revisit this episode. But here’s what I noticed: there is a depressingly formulaic approach to Lazarus that ranks it alongside any number of other stories. 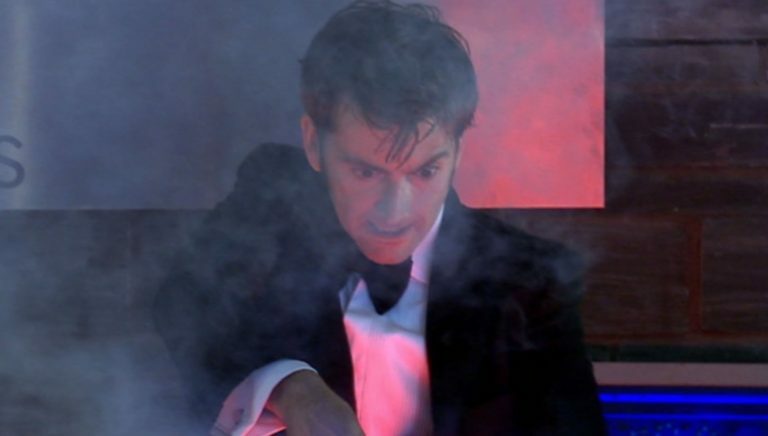 The setup is perfunctory: the Doctor and Martha attend a party in a research lab (the sight of Agyeman in a posh frock and Tennant in a dinner jacket pleasing just about everyone) and mercifully without having to explain away their presence, thanks to family connections. 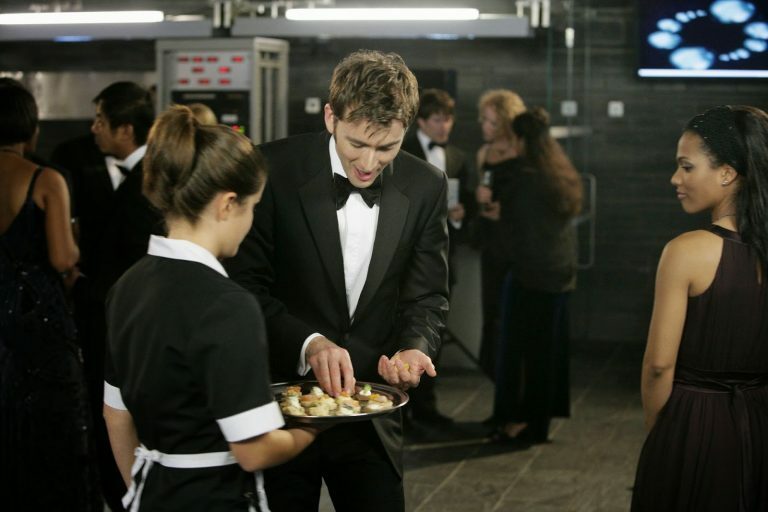 The Doctor has his first encounter with Francine Jones, and gets overly excited by the vol au vents. Then Mark Gatiss steps into a portaloo and emerges looking 35 years younger, which is incidentally the exact opposite to what normally happens when you try out the public facilities in London. The experiment, it seems, has been a success… or has it? Before long, all hell has broken loose and Martha has to contend both with a rabid, flesh-sucking monster and – far worse – the meddling of suspicious relatives. It concludes with the Doctor playing the organ. Lazarus falls to his death from the top floor of Southwark (actually Wells) Cathedral: the shock is enough to destroy the monster within him and return him permanently to his human state. Some of you will remember that The Death of the Incredible Hulk (another play on the Jekyll-and-Hyde myth) concludes in much the same way; the Hulk takes a tumble from a plane and lands on the tarmac, reverting back to Banner just before he dies. That was pretty underwhelming, now that I think of it. There is an amusing sequence involving carrot cake. The rest of it’s dull. So too is Lazarus. It serves to advance the relationship between the Doctor and Martha by having him officially accept her as a companion; it does so within the confines of the most soul-crushingly tedious material possible. There is very little that is intriguing or engrossing about Richard Lazarus except that he is a lecherous creep both in and out of makeup; his girlfriend looks like a reject from Downton Abbey and there is not a single interesting supporting character, with the possible exception of the shady Saxonite who approaches Francine from the sidelines and whispers naughty things about the Doctor. He has no name that is known to us; I don’t know why I call him Gerald. But there’s something to be said for filler material. It highlights the highlights, as it were. Listen, if you asked someone to sing you a song from Les Misérables, you’d probably get a rendition of One Day More, Do You Hear The People Sing? or (if you’re unlucky) I Dreamed A Dream. You probably won’t get Castle On A Cloud; you’re even less likely to get Upon These Stones, worthy as both contributions are to Boubil and Schönberg’s magnum opus. They’re forgettable linking material that pads out the narrative until the Thenardiers come back on. You can’t have a musical where every number is a work of brilliance, unless you’re doing West Side Story. Paul Simon learned this the hard way when he wrote The Capeman, in which he insisted that every song should be as good as Bridge Over Troubled Water or The Boxer: the end result was bland and insipid and closed after 68 performances. “I think it’s toss,” says someone else. You can’t argue with him. There’s a lot of moral hand-wringing in Doctor Who. Eccleston was notorious for it, flippantly dismissing Rose’s concern about the Gelth’s mass corpse hijack with the words “It’s a different morality – get used to it or go home” (easy to say when you’re not the one having to look at a man who resembles your dead granddad calling himself Shirley and doing a music hall number at a WI benefit concert, in a wig and heels). Later in the series, Rose calls him out for his hypocrisy, not long after she’s meddled with history. “I know what I’m doing,” he rebuffs. “You don’t” – which was, now that I think about it, the British Empire’s entire defence of colonialism. Things don’t improve when Eccleston regenerates; instead we get an incarnation who’s sarcastic and patronising (“Oh… you humans!”), instead of boorish and mean. He is thrust onto a pedestal at every conceivable opportunity – those well-fitting suits have nothing to do with anything, of course – but there’s no getting away from the fact that Tennant’s Doctor is basically a d*ckhead. But I can’t pad this out for an entire article. Well, I probably could, but it wouldn’t be about The Lazarus Experiment; it’d be a general treatise on the Doctor’s ‘Do as I say, not as I do’ stance, and that feels a bit like cheating: we need to stay on topic, however loosely. 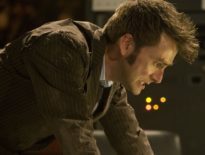 What’s particularly grating about this episode is that the moralising runs through it like the Avon through the middle of Stratford: the Doctor’s wary conversation about variables, falling on deaf ears (why oh why oh why don’t these people watch TV?) 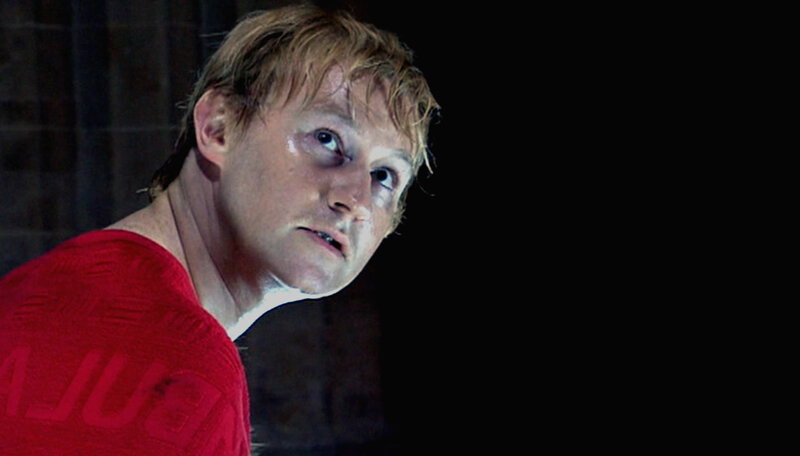 to the bit on the rooftop and that tedious eighty/ twenty quote that makes the Tumblr feeds, right through to the final conversation in the church, Gatiss hunched on the stone floor, shivering and cloaked. Can’t we just see him eating someone? 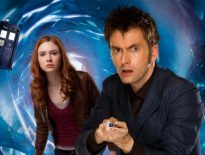 The thing is, the longer Doctor Who is on, the more we’ll write about it. And the more we write about it the less there is to say; you have to drum up new perspectives for old stories. Lazarus, one suspects, doesn’t actually bear close analysis because it’s so by-the-numbers (in a way that, say, Blink is absolutely not). It’s not that it’s a bad story; it’s just not a particularly interesting one. Quatermass got there first. It is the sort of thing you read in a hundred Spider-Man comics: a tale fit for an annual, perhaps, but that’s all. It is the mad scientist who takes a catastrophic tumble into a midst of amoral darkness and is eventually destroyed by the dashing hero and his girlfriend. Cut to Patricia Quinn’s lips. There are about a dozen films called She, but process of elimination tells me that he’s referring to the 1965 Hammer Horror starring Ursula Andress as an immortal tribal queen who tries to tempt a visiting traveller with promises of eternal life, only to do a Sara Kingdom in the final reel. Doctor Who did plenty of classic horror tropes back in the ’70s, of course – touching on Jekyll and Hyde in Planet of Evil, and dabbling with immortality in State of Decay. Says someone else: “Dedicate a paragraph to aliens’ perspective of the social construct of youth and beauty. Don’t give in to pressure or you’ll end up a giant, BBC special FX scorpion being.” Yes, the scorpion was a bit rubbish, wasn’t it? It wasn’t The Mummy Returns rubbish. Just Pouncing Slitheen rubbish. It says something about the state of British television when “Could have been worse” is the sort of faint praise with which we damn the likes of Doctor Who on an almost weekly basis, but there it is. I’ve not seen She, nor am I inclined to seek it out, at least not for this. That’s another avenue left uncharted; I’m dealing in fragments here. But then there’s a light bulb moment: would it not be possible to write something about how some episodes of Doctor Who are so average that they don’t actually stand up to further scrutiny? And that all this trouble I’ve been having encapsulating my views on Lazarus might actually work if I put it down on paper? Well, fine, I’ll do that. But I won’t start yet. I have to play Exploding Kittens with the eleven-year-old. It occurs to me I’m blocked. Mercifully, Christian Cawley (yes, that Christian Cawley) has written a helpful guide to what to do when you get writer’s block, which has come up on the news feed. “Take a break”, he suggests. So I have another one. The washing up won’t do itself and there’s an England match coming up. During my fourth school run of the day (our lives are complicated), a thought occurs to me: Charlie Kaufman followed Being John Malkovich with a screenplay about why he was unable to write anything after Being John Malkovich. It won him a BAFTA. Could I win a BAFTA for this? A Hugo? At least some sort of local journalism award? Look, I’ll settle for a couple of retweets. Freelances like me are pilot fish; we chomp at what we can get. And thus it concludes: Lazarus jumps from the ambulance and runs off into the night, and is restored to the wizened husk we saw at the episode’s beginning. Martha presses the Doctor for a role as a full-time companion; he accepts, and they both go off to catch a little sun. And somewhere along the line we’ve managed to print two and a half thousand words about nothing at all. And perhaps there is a place for it: perhaps these superficially lightweight, ephemeral stories have a role to play in the colossal wall of Who, part of a grandiose and semi-coherent facade, in which some bricks are more prominent than others but all have a purpose to serve in keeping the wall up. It’s just a shame some of them are so inconsequential to look at: simple, thick, and dull. “This is the way the world ends,” says Tennant, slightly misquoting Eliot. “Not with a bang but with a whimper.” Sort of like my career, I suspect. ← Enjoy Lethbridge-Stewart: Piece of Mind Completely Free!